BEASTS AND BULLETS ABOUND IN THE MEAN STREETS IN NEW PRIVATE EYE SUPERNATURAL THRILLER FROM PRO SE PRODUCTIONS! Known as an innovator in Genre Fiction, Pro Se Productions announces its latest release, a digest novel that seamlessly blends the classic Private Investigator archetype into a world of urban fantasy laced with monsters and murder. Full Moon Affair, Veteran author Richard White’s first in a new series of digest novels is now available in print and digital format from Pro Se Productions. Calasia is a nice little town if you don’t mind running into the occasional oddball, street thug, or troll. It was a pretty normal summer day when Ze’eva Blackthorne approached Theron Chase, a detective, with a problem. Someone was trying to kill her. Even worse, that someone seemed to know her deepest secret, because why else would he be using silver bullets to try and knock her off? To make matters worse, it seems that everywhere Ze’eva and Theron go while he’s investigating the case, assassins and bodies keep turning up and the local cops are more than happy to blame the growing body count on Theron. The clues all seem to point to one thing. While Ze’eva is the target, she’s not the ultimate prize. Apparently the person behind this threat is after her father, a man she’s never met, and this mastermind is pulling out all the stops. Theron soon learns there’s a new threat . . . an assassin who has the ability to assume another person or creature’s shape. So now, Theron must protect his client from anyone and everyone they meet and still try to solve the case before someone decides to end Ze’eva’s singing career—permanently. From author Richard White comes the first in a series of supernatural Private Eye adventures featuring Theron Chase. Thrill and chill to the perfect blend of mystery and monsters in Full Moon Affair. Richard C. White is the author of several fantasy works, including Skin the Cat and Wings of Fire. Additionally, his newest novel, On Wings of Steel, will be released by Musa Publishing as a part of the Darkside Codex, a shared world project that he helped create. Along with writing Fantasy and Science Fiction, Rich has been bitten by the "New Pulp" bug and has several stories coming out by Pro Se Productions in the near future. The first of his, "Notes in the Fog" was released in the Charles Boeckman Presents: Johnny Nickle duology in May 2013. He also is a media tie-in writer, having written for Star Trek, Doctor Who, and The Incredible Hulk. His novel, Gauntlet Dark Legacy: Paths of Evil, was the best-selling tie-in for his publisher in 2004. 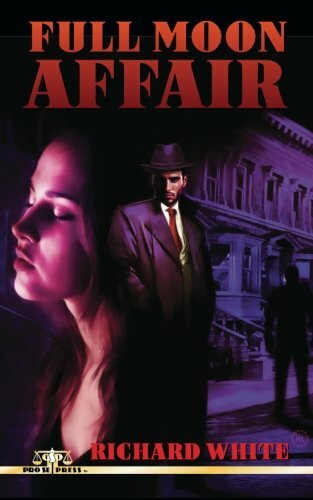 Full Moon Affair, featuring a haunting cover and logo design by Jeffrey Hayes and print formatting by Forrest Bryant, is available now in print at Amazon and Pro Se’s own store at http://prose-press.com/pro-se-store/ for $9.00. The ebook edition designed and formatted by Russ Anderson is available for only $2.99 for the Kindle at Amazon and most other formats at www.smashwords.com. RUSS ANDERSON JR’S FLY GIRL FLIES INTO FOURTH NEW ADVENTURE AND FLY GIRL’S FIRST TALE NOW AVAILABLE FOR FREE PERMANENTLY!